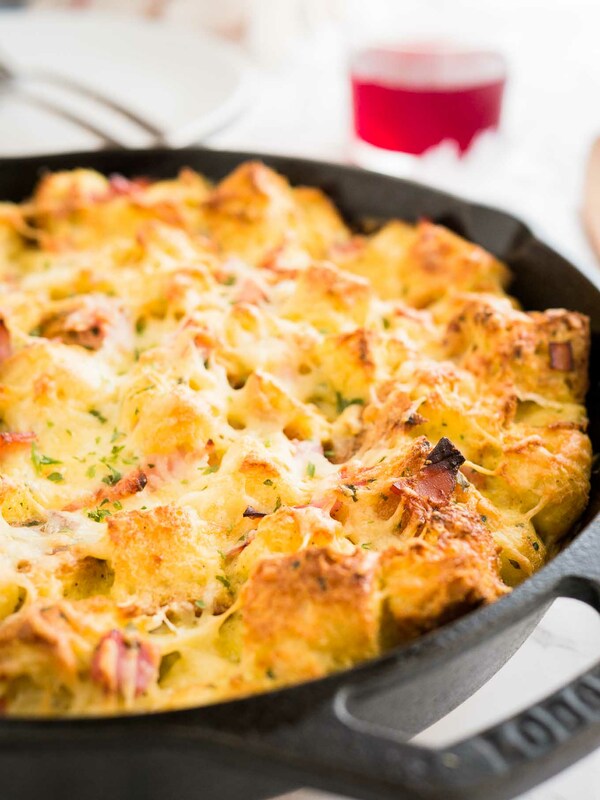 This Ham & Cheese Breakfast Casserole is the perfect dish to use leftovers! 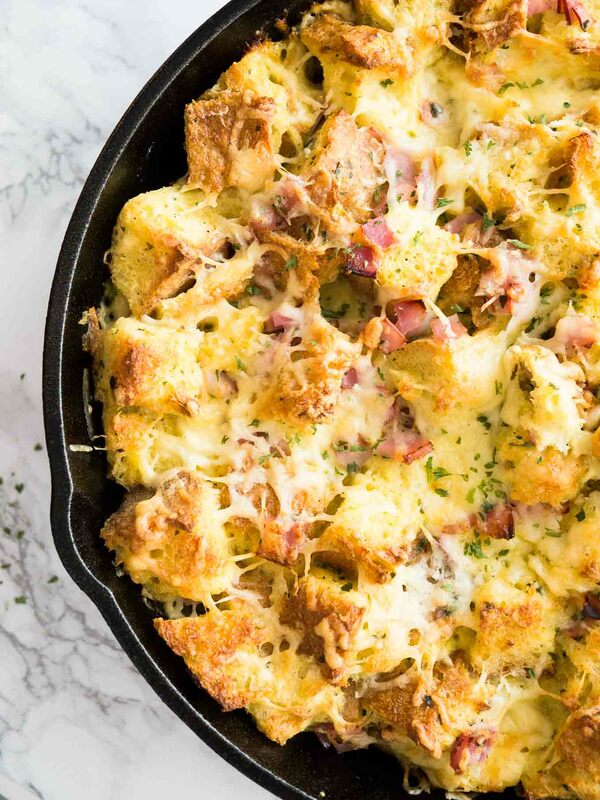 A delicious breakfast bake or strata made with bread, cheese, and ham that will become your family’s favorite. 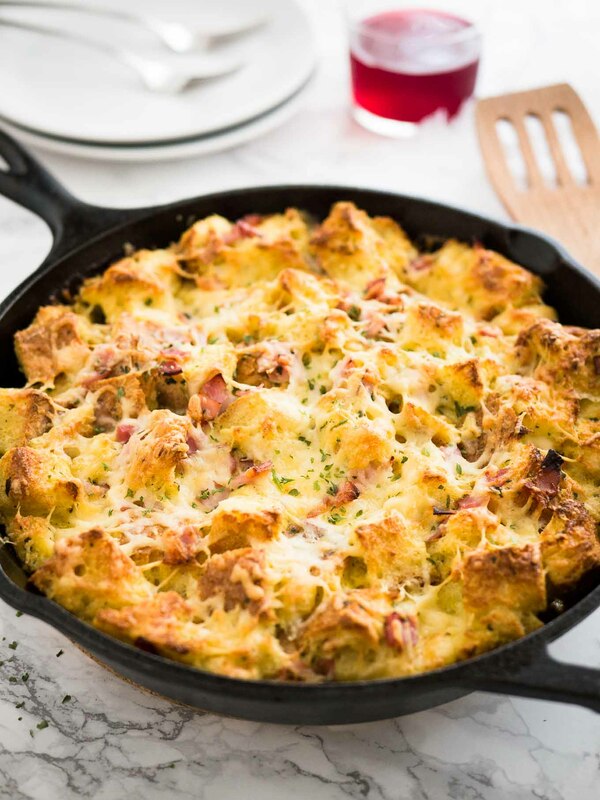 No matter what you call this savory breakfast dish – breakfast casserole, bread pudding, savory french toast bake, or strata – it’s totally delicious! It tastes like a mix between an omelet, french toast, and quiche and will have your family beg for more. This is one of my husband’s favorite things to eat in the morning, made with lots of cheese, diced leftover ham, eggs, and Italian bread cubes. It’s one of those easy dishes that you can throw together in minutes and use what you have left from a big meal the day before. Perfect for the Holidays! 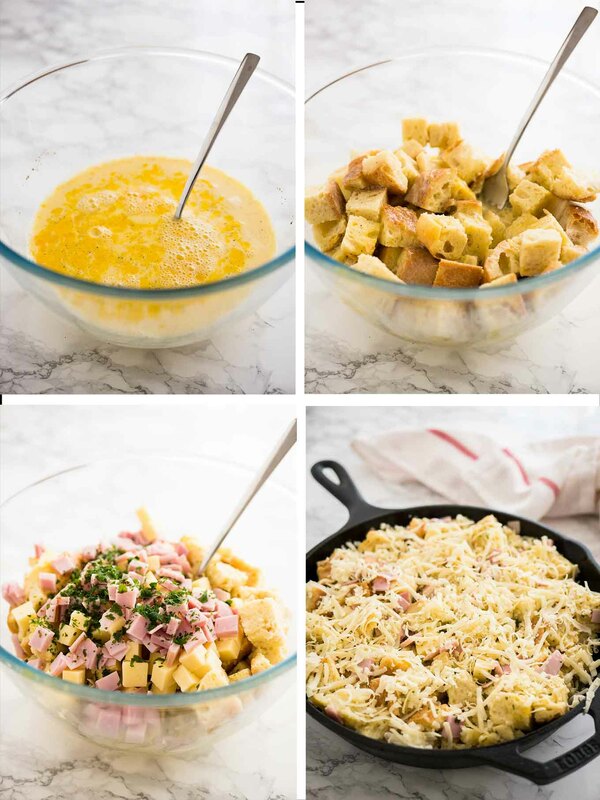 Making this ham & cheese breakfast casserole is so easy! You don’t need to exactly measure out the ham and cheese, just use what you have and play a little with the ingredients. Don’t have enough ham? Just use crumbled bacon. Don’t have enough cheddar? Use what you have, Gouda, Mozzarella or many other sorts of cheese work great! 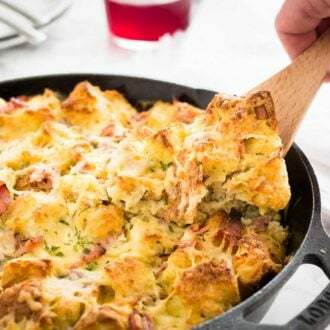 I love to make this breakfast casserole on the weekend or for special occasions like Easter or Christmas. 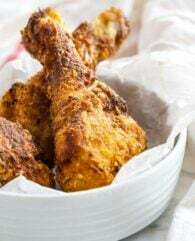 It’s a great dish to feed a crowd and easy to prepare. I use Italian bread most of the time because it has a softer crust and I’m a little bit impatient. 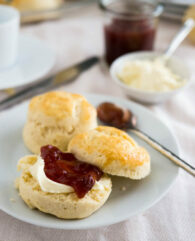 For bread with a soft crust that is only a little bit stale, 10 minutes are enough to soak up the egg mixture. 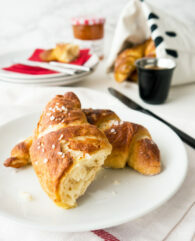 But you can also use baguette or a crusty white bread, just let it soak a bit longer. This casserole with ham and cheese is soft on the inside without being mushy and slightly crispy on the edges. 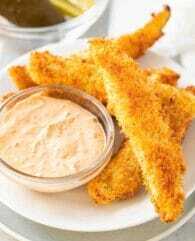 The cheese cubes inside make delicious little cheesy pockets and the grated cheese on top gives you a delicious crust! It’s my favorite savory breakfast! Serve this breakfast bake together with a beautiful Spinach Tomato Quiche, my fruity Raspberry Muffins with Streusel Topping or Apple Cinnamon Muffins, and an easy but impressing Banana Bread with Maple Walnut Topping and you have a breakfast spread that everyone will enjoy. 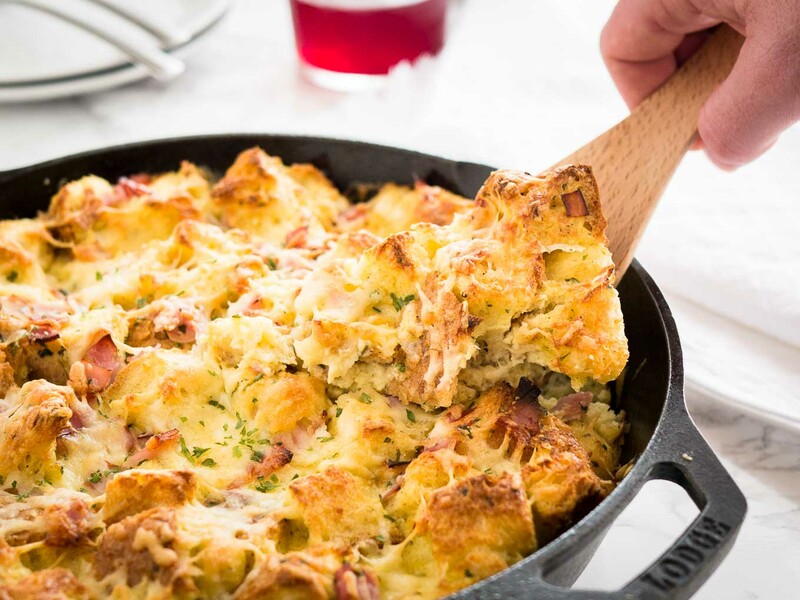 This Ham and Cheese Breakfast Casserole is the perfect dish to use leftovers! 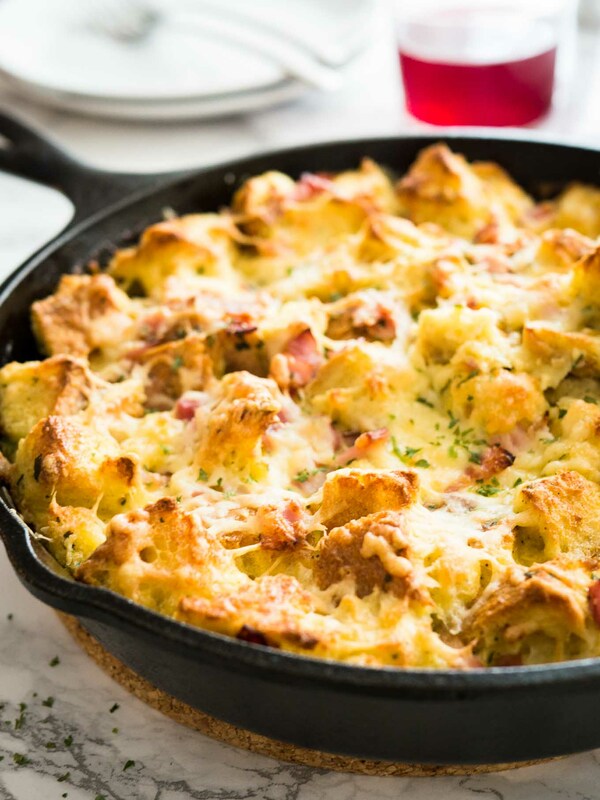 A delicious breakfast bake or strata made with bread, cheese, and ham that will become your family's favorite. 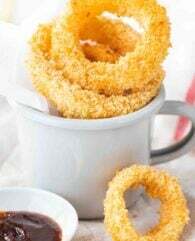 In a large bowl, whisk the eggs with the milk, salt, and pepper. Butter a 10" skillet or a 10" square baking pan and pour in the mixture. Sprinkle the grated Cheddar cheese on top. Bake for about 25 minutes, until puffed and golden. Let cool slightly, sprinkle with the remaining parsley and serve. Christmas morning perfection right here. 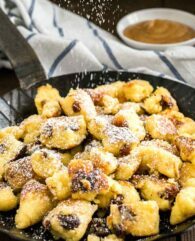 Simple and delicious and something everyone will love! Totally trying this out! It’s one of my favorite breakfasts! 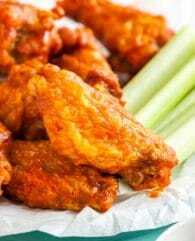 So easy to make but so delicious. 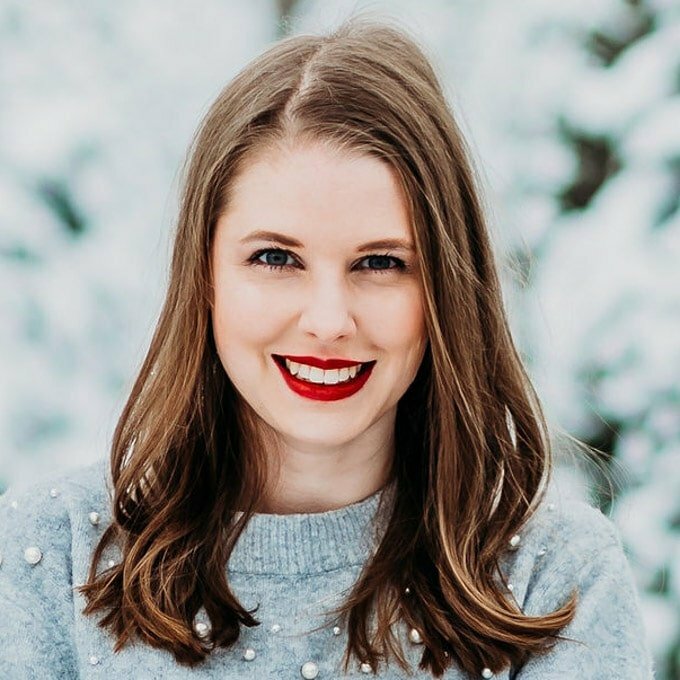 Happy Holidays, Karly!